Not everyone uses OmniFocus the same way. You might, for instance, use Defer dates a lot — or not at all. And that’s totally fine. We expect different people to use the app in different ways. 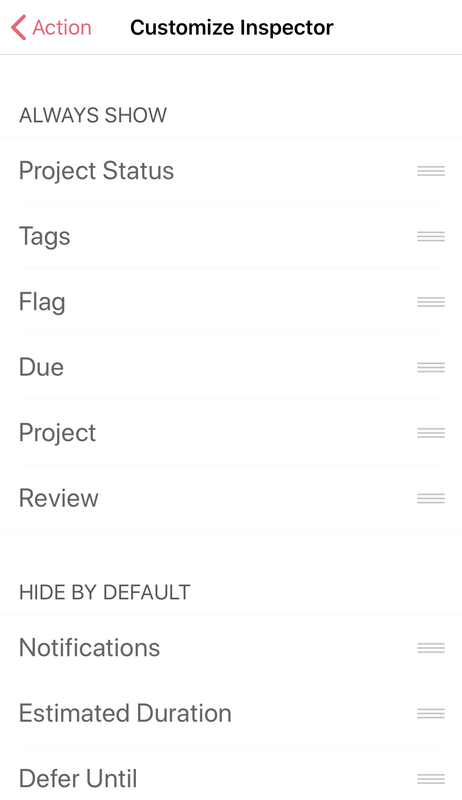 And, because we expect that, we made OmniFocus’s inspectors flexible: you can show the features you use and hide the ones you don’t. You can even reorder them, so that your most-used features are easiest to tap. We chose what we think are sensible defaults — what we think is a good configuration for most people. But there’s nothing magical about the defaults, and we encourage you to make it work the best way for you. Tap the Show More button at the bottom of an inspector. This will show you additional features — which might be a list like Estimated Duration, Defer Until, and Repeat. To move an item, tap and hold on a grabber on the right, and just drag it to where you want it to be. You can move these across sections — from “Hide by Default” to “Always Show,” or the other way — and you can move items up and down within a section. When you’re finished, just tap the back arrow at the upper-left of the screen, and you’re finished. You can, of course, come back any time and edit the inspector again. Just remember, though, that the goal of OmniFocus is accomplishing tasks!